excoriating analysis AM and I tend to agree..BUT these “Mr. Slippery’s” as Hitchens labels them (him) have a tendency to salvage reputations (within the bubble) and not only survive but thrive on a personal and sometimes professional level even on the fringes of politics…..
Blair being the ultimate craven example. A very insightful posting. I also noticed the narrow victory for common sense, a majority of thirteen!. In a parliament of 650 on a matter of war or peace our representatives could only muster a majority of thirteen. Thank god it was enough, but it illustrates the strength of party loyalties over national need. Cameron now pays for his contempt for his party and his people. For the first time in centuries Britain has avoided voluntarily going to war without any threat of invasion. a Moment of awakening. . If the man had any vestige of ‘noblesse oblige’ then he would fall on his sword. Can he have a single redeeming feature, from the moment he became Conservative leader I have searched in vain? No wonder the war vote was lost. And fortunately too. It would have been a war with no clear objectives, other than to be against Assad & his cronies – while trying to avoid handing over Syria as a gift to extremists. And while using the presence & use of chemical weapons as the entry-card. Instead, the only justification for any involvement at all would have been to rid Syria of its chemical weapons – with them, & those handling or hiding them, as the only legitimate targets. Yet even that limited objective might have easily led to mission creep, especially if either side had refused or been deliberately uncooperative over the elimination of whatever chemical weapon stocks they had. 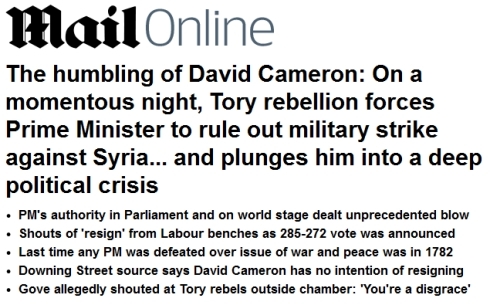 After all, Syria’s civil war is Syria’s business – something that Cameron has been very slow to admit. Thank God the mother of parliaments has had the courage to stand up to warmongering Obama. I’m getting worried because I felt that Milliband and George Galloway made the most sense. The Assad regime has managed to keep a country potentially riven by religion together. It’s by no means ideal but it is at least functioning. Handing it over to the Muslim Brotherhood (Google for Obama’s close links to that organisation) would be a disaster for all non-Muslim religions – and even some Muslim sects which aren’t hardline enough. For those who can see outwith the box, it’s obvious what’s happened here. The US wants rid of Assad. They have funded and encouraged the rebels (aka murderous fanatics) to topple Assad. They are failing. Obama wants to tip the battle in the rebels’ favour by seriously weakening and degrading Syria’s military capability. The rebels have launched the chemical attack so that the US and its puppet allies can put the blame on Assad as a pretext for action. Thanks to the growing alternative media, people no longer buy into the official Government/BBC version of events. Even MPs are now questioning what’s going on, leading to the Commons vote against Cameron. 1. Obama said chemical weapons are a red line that Syria must not cross without risking US action. Why would Assad do something that he would have to realise would inevitably lead to his demise? 2. He could gain no military advantage from the attack. 3. A chemical weapons attack would make him the world’s pariah. 4. The Russian foreign minister claimed the chemical attack was propaganda designed to increase the chances of US intervention (possibly vested interest here so better be cautious). 5. The rebels have reportely used similar tactics in the past. 6. There is no clear evidence saying the Assad regime carried out the attack and there are far more compelling reasons for the rebels having done so. 7. Assad is already winning the battle against the rebels. Sorry for the lengthy post but some people need help to see beyond the Left-Right Paradigm and into the covert goals of the ruling elites. AM – fair enough if all you want to do is attack a politician for being a politician; however,you have missed the really important point which is that the outcome is a victory for parliamentary democracy, and in the absence of your harrogate agenda, with which absence we will have to live for a long time, that is a good thing. It may have been a narrow victory, and it may not have been the result Cameron wanted or expected, but that doesn’t actually matter. For whatever reason he did the right thing, and I suspect that might well be his legacy – ie. an important lurch away from the parliamentary dark age of the Blair/Brown years. Clarence, yes it should have been 272 – I’ve corrected the article. Thanks for that. I think you are wrong Cuffley and I will be addressing your point in a follow up post later today. Should not Cameron now go back on holiday and stay on holiday? Agree with your every word AM. As to a UN resolution; does this mean that China and Russia are in favour of chemical weapons? And are not Napalm and Thermite already proscribed instruments of war? Can we now get a real Conservative leader to organise our departure from the wretched European Union?